Put a packet of good spaghetti into a large pan of water which should be at a rolling boil. Heat olive oil in a frying pan and add 4 thinly sliced cloves of garlic. Careful it does not burn. 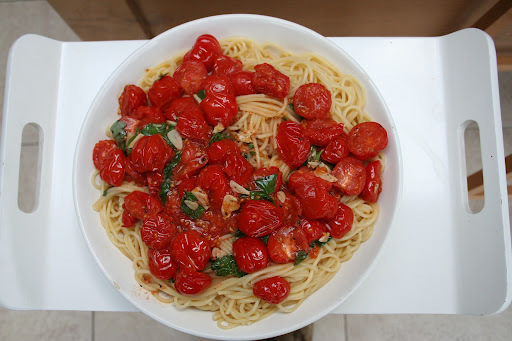 Take a good pound of very tasty cherry tomatoes from the grocers and cut them in half and put in the pan with the garlic. You don’t really want them to cook more to heat through so lower the heat a bit. A minute or so before the pasta is ready squeeze in the juice of a lemon into the tomatoes and season with salt and pepper. Drain the pasta, tear some basil into the tomato sauce. Pour the pasta into a large white bowl and slide the sauce on to. Eat with parmesan cheese. We listened to a fantastic song called Country Line by Cass McCombs. We saw him live earlier this year and this was the last song that he played. It was totally unexpected, one of those wide open songs that seem made for the mythical blue roads of America.